It has been over two months since my daughter was born so I shall try to recollect the event as vividly as possible. It seemed more vibrant just one month ago and now that my body has changed I seem to also be transitioning away from that subtle reality of birth. The birth began at two o’clock, or a little past, on the morning of the twenty-fifth of November. I awoke to an unknown feeling in my uterus and thought it may be the beginning. I was having minor contractions every twenty minutes and I was still uncertain if I should awaken my husband and alarm him because they seemed so insignificant. This was definitely a pain that I could not sleep through. I would rest my head on the edge of the bed in child’s pose during the rushes and then sleep in the pause between. I was timing the frequency and I knew there was never more than thirty minutes between each one. Still, I managed to sleep soundly enough to dream between those pauses. Finally, the sun rose and I tried to eat breakfast seated as usual but I managed to kneel next to Jan (my husband) and hold him for support when I needed it. By now he had confirmed that I was in stage one of the birth. Jan left the flat shortly after breakfast to arrange for his coverage at school. It was during this time that I was alone to contemplate in the silent room by daylight. I acknowledged the strength, Love, and support offered to me by so many friends so recently. 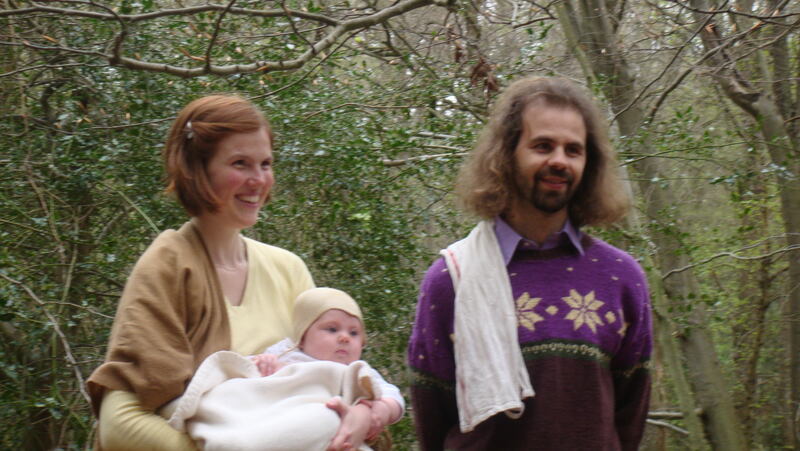 The previous Sunday I was given a baby shower by my teachers, classmates, and friends of the Eurythmy school. Then I began to meditate on one of the gifts- a trio of paintings depicting the annunciation, incarnation, and presentation/baptism of a child. I gazed at these by the window, journeying into the reality with great depth of soul for my whole being was so present that day. I received a call from my mother (who lives in America). She had a sense that I was in pain in the night and wanted to check on me. She assured me that the first stage of her first birth was 12 hours long. This knowledge of her experience helped me to just breathe and enjoy this first stage since I knew it may be longer than I expected. I took a rest in bed, sleeping a bit after that phone call. I continued my meditative reflections after resting. I recalled the time my child was in my womb, reflecting on where we travelled and what I experienced each day and week. I imagined how this could prepare the baby within. And it seemed like a dance, so I did slowly dance a bit, cradling my womb and rejoicing over the time we had spent so close to another. I then told the baby farewell in my own bodily manner, inviting the child to come into contact in another way. Now was the time to make a transition into the sensory realm of Earth. Oddly enough, my first stage was about 12 hours in length. I managed to eat a lunch that Jan prepared- pasta as recommended by our birthing coach. Then around three o’clock I experienced shorter intervals between the rushes. These rushes were much stronger. So, I would lean on the birthing ball and breathe nice and deeply, often Jan would join me if he was in the room. And other times I would lean on him, so long as I was kneeling and rotating my hips. Yael (our doula) came for an hour or so and we had a snack. It was such a calm, quiet conversation that we had during this snack. I think I only ate because Jan and Yael were eating. I was glad that she encouraged me to do so. Jan took a rest after this so he was refreshed for the evening. Then the rushes became quite intense and I knew I needed to get in the tub to relax. In those still moments between rushes I noticed that the movement of the uterus was not an upward pull towards my heart as before but rather an expansive, horizontal stretch to open the cervix more in dilation. Soon after this Yael came. She and Jan did what they could to answer numerous phone calls or other practical actions. One of them always attended to me whilst the other acted. I remember the moment when Yael approached me in the bath. She entered seeing my unclothed body in the water for the first time and said, “Isn’t she beautiful.” I felt like a mermaid at this moment, for I was acting in a way that was entirely new to me and being acknowledged for my presence regardless of this new situation. That was the only phrase uttered to me directly by Jan or Yael throughout the birth. They brought their support more in their actions and breath- that is what I needed most. Yael and Jan took turns attending me as the midwife arrived, one of them spoke to her. There was a bit of confusion with the midwife because the next one on duty was coming straight from East Grinstead since she was closer. I had never met this midwife, as mine was on holiday, and I felt a bit disturbed that I could not make polite introductions with her. However, I quickly realized that she was present and eager to dive into the activity without such formalities. I must admit that I was sceptical of the scent of this midwife. Her perfume was so strong. I could hardly think to speak at this time but I told Jan that I could not handle her perfume. However, I decided that there must be a reason she was the one to come and I learned to appreciate her distinct smell for I always knew where she was even if my eyes were shut! I should like to remark upon the difference of presence with Jan and Yael, since I had them one at a time at this stage. Yael placed her hands on my sacrum and pured water down my spine- all in one continuous motion, intuitively keeping my body relaxed and calm, like a constant flow of relaxation. Jan was more my inner support and breath, for his breathing is deep and long-winded—this helped me to follow him. It seemed that I could just join him and rely on his breath. When I finally had a chance to exit the tub between the rushes, I made it to the bedroom for the midwife to check the status of dilation and if the waters had burst. This was quite uncomfortable and it may have been because I sensed what would soon occur. As the midwife, who was under pressure to examine me between the rushes, checked to feel for the water sac she said, “I do not feel it…hmm…wait” and I felt a surge of liquids flowing from my vaginal opening. This definitely sped up the labour and I had the intuition now that I must get into the bathtub again to alleviate the pressure. I could then feel the baby’s head against my cervix where there was no longer a cushion and I wanted to somehow alleviate that in the water. The stage now, as the dilation continued, was the most physically intense. I could feel this downward force and I instinctively wanted to balance it with an upward force. With each rush it felt as if the baby’s whole energy was centred in the head just pushing earthward. I needed to tell the baby it was not time yet, with my entire body. So, I held onto Jan’s forearms and exerted my forces upward as the baby bore down. This felt like the narrow passage of the sound “U” as made physically apparent. The baby and I were balancing energy in this channel. The “Suuuu” breathing made this all the easier. All this while I was soothed by the water that Yael was running down my spine and by her continual massage of my sacrum. Her gestures made me aware of the feminine force I needed to relax while at the same time I counted on Jan to be a pillar of masculine energy for me to hold for strength and reassurance of my inner strength that he was. As he was in front of me and she behind this felt like I was on a balance of energies as I kneeled in the water. We all breathed together and if my breathing was too high I could count on them to guide me into the lower, deeper breaths. I did begin to feel weak at one point, mostly because my knees were uncomfortable from kneeling. This discomfort took me out of the present moment and I began to wonder about the time- how long would this last? How much time had passed? I said to Jan, “I cannot do this anymore,” and I tried to seek some visualization to lift me. After this moment of doubt I let go and gave over to trusting in the moment. Then I was completely relaxed, though still active, to really breathe into the opening. I needed no visualization or mantra but just to breathe into that lower part of my self and succumb to the present. I felt connected to the Earth’s forces, though I was not touching the Earth, but merely allowing myself to be one with this Force. And then I knew the baby was ready to emerge. The pushing seemed lower than before. I somehow managed to hold onto Jan and shakily walk into the main room of our little flat. I lay down on the floor for the midwife to check the progress of dilation. She proclaimed that the cervix was indeed ready and time to push the head out. She said, “Now, the chanting has been lovely (referring to the Suu breathing) but I really want you to push now as if you are taking a big poo.” I did not allow these concepts to form my actions. I still found it more of a release than a push, though I was active in that release, rather like a push without strain. I squatted low holding Jan’s forearms and breathed out with force with the next rush. Then I had such a span of time to relax between the rushes and it was a beautiful moment for me- this awareness that I could feel the head of a baby just transitioning into existence on Earth. I have no recollection of pain from the last stage, just release. The baby was calm, though it took three pushes, and allowed me such breath and reflection between each one. At the final push I was nearly standing and then a baby so easily slid out of me into the arms of the midwife. I was handed the baby with Jan, who was next to me now, holding me as well, and we did not know the gender for the cord was between the legs of this fresh human. We just gazed at this baby who looked around in wonder and after recognizing a new place let out a cry. That is the birth story of Atalante Francine Denise Erkelens from the perspective of her mother.